What is the PEARSON Function? 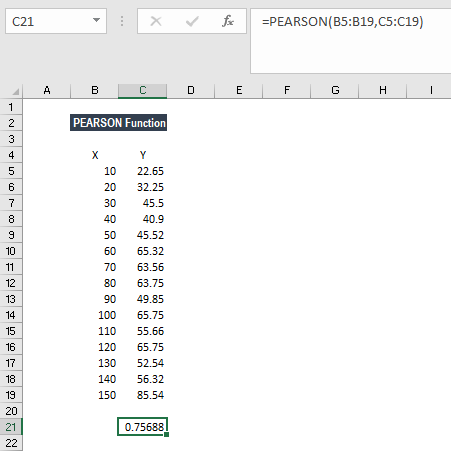 The PEARSON function is categorized under Statistical functionsFunctionsList of the most important Excel functions for financial analysts. This cheat sheet covers 100s of functions that are critical to know as an Excel analyst. It will calculate the Pearson Product-Moment Correlation Coefficient for two sets of values. For example, we can find out the relationship between the age of a person and the appearance of grey hair. As a financial analystFinancial Analyst Job DescriptionSee a real Financial Analyst Job Description including all the skills, experience, and education required to be the successful candidate for the job. Perform financial forecasting, reporting, and operational metrics tracking, analyze financial data, create financial models, the PEARSON function is useful in understanding the relationship between Earnings per Share (EPS)Earnings Per Share (EPS)Earnings per share (EPS) is a key metric used to determine the profit for the common shareholder's on a per share basis. Earnings per share measure each common share’s profit allocation in relation to the company’s total profit and can be calculated based on basic shares outstanding or fully diluted shares outstanding and other financial metricsAnalysis of Financial StatementsHow to perform Analysis of Financial Statements. This guide will teach you to perform financial statement analysis of the income statement, balance sheet, and cash flow statement including margins, ratios, growth, liquiditiy, leverage, rates of return and profitability. See examples and step-by-step instruction. Array1 (required argument) – It is the number set of independent values. Array2 (It is a required argument) – It is the set of dependent values. If the value of r is close to +1, it indicates a strong positive correlation, and if r is close to -1, it denotes a strong negative correlation. 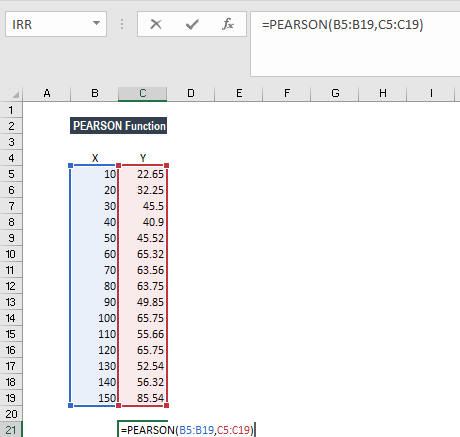 How to use PEARSON Function in Excel? The result above implies a positive correlation among the data sets. #N/A! error – Occurs if the given array arguments are of different lengths. #DIV/0! error – Occurs when either of the given array arguments is empty or when the standard deviation of their values is equal to zero. The PEARSON function performs the same calculation as the CORREL function. 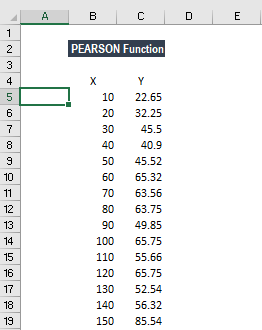 However, in MS Excel 2003 and earlier versions, PEARSON may exhibit some rounding errors. If an array or reference argument contains text, logical values, or empty cells, the values are ignored. However, cells with the value zero are included by this function.